Featuring a limited print run, the 2016 Topps Super Bowl 50 Team Sets are exclusive to the Topps Online Shop and offer a detailed look at the Carolina Panthers and Denver Broncos. 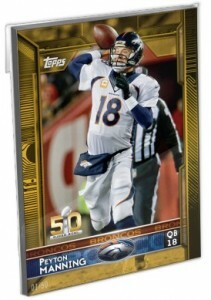 Sold separately by team, each set is found directly on the Topps website. Limited to 50 copies per team, the sets are initially priced at $59.99 and feature jumbo versions for each team, including all the players that are found in the 2015 Topps flagship base set. Showcasing a 5"x7" sizing, the exclusive cards add a gold parallel border and the Super Bowl 50 logo to the design. 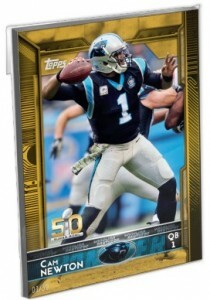 Because the subjects are based on what is found in 2015 Topps Football, the Panthers feature 13 cards and the Broncos have a few more, with 19 cards. 2015 Contenders Football 💥Jordan Taylor 💥Rookie Auto 💥Denver Broncos!! 19 cards. Serial numbered #/50.